Completely implausible stuff that could never REALLY happen, right? Hey guys, one of our readers reached out for some help. An IndieGoGo fundraiser was started to help Ravyn Crescent. Check it out and help if you can. If nothing else, spread the word! LOL as I said a one way trip to HELL, never said the body wouldn’t be coming back! 1. I don’t get it. 3. I still don’t get it. 5. Uh… nope. I don’t get it. 6. First guess: Fantasia? Second Guess: My Little Pony? 7. Is that the bus from The Great Divorce? If so, where are the ghost-people? What the heck: I don’t get it. So I guess the plan was to drive the psycologist insane and ruin his credibility with Luci’s dad.Then her dad would take her out of the program and things would go back to normal. If only things could be so simple in real life. Ah, don’t worry, the amazing power of denial will kick in and all will be right with the world. I love how pain is still proud of whatever that glowing thing is in the hole at the beach, and tears and allisdair are still worried about it. Also, I agree that them being scared of the unicorn is funny. 5: Indiana Jones giant rock. 7: The Bus from the end of “Defend your life”? Maybe? I see that you subscribe to the theory that child psychologists are full of anti-funons. 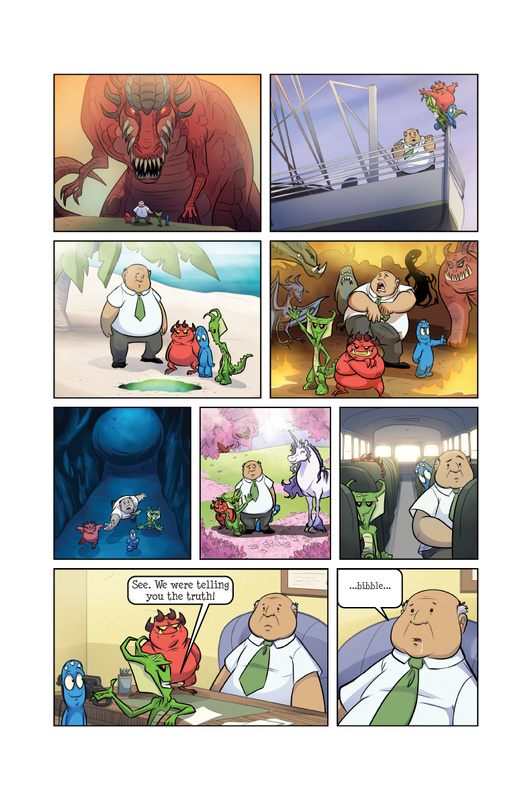 @sarita and Elfguy, I’m pretty confident that panel 3 is a reference to the “Life’s a beach” arc. So they sank the Titanic? Not 100% sure about the green pool, but I like Elfguy’s take on it…I have not seen Star Trek in ages and I cannot remember much except how disappointing the last 3 movies were. They’re darn right to be afraid of the unicorn! When those beasts first emerged in our writing, they were fearsome, evil creatures! Forget Twilight Sparkle and Rarity, unicorns are evillll!!! Uh, no I do not know what those names mean or where they came from. They uh…just sound like unicorn names, is all. Yeah! That’s what. Also, poor Doc! bibble indeed.